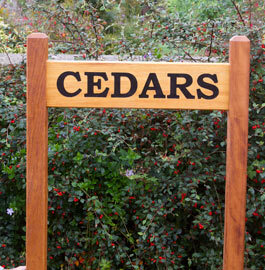 Wooden entrance signs on posts are ideal for the end of your drive. As always we have lots of choices. 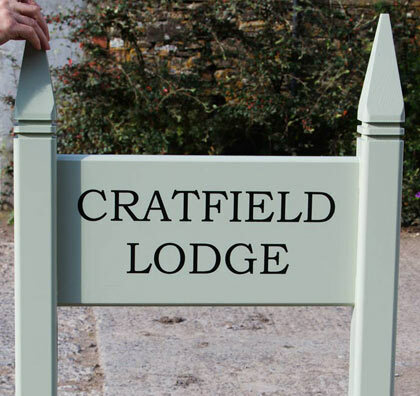 Firstly you can choose between a natural wood with painted carved letters, or a painted entrance sign in a lovely range of colours. 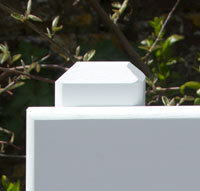 There are also four types of post top to choose from. For a natural wood we usually use oak but iroko is another option. 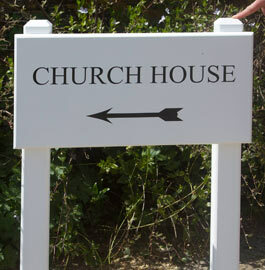 Most of our painted signs are made in oak but there are different post options. Oak is the heaviest and longest lasting, Idigbo is a lighter weight moderately durable hardwood. Softwood is considerably cheaper. The beautiful grain of the oak does remain visible beneath the paint. If you prefer not to see the grain we suggest you have a Tricoya board.This is a very tough and completely weatherproof wood based board. Accoya wood is another option and this is priced the same as oak. 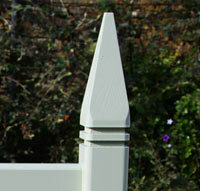 Extensive testing has shown that paints can last up to three times as long on Accoya than on other timbers. 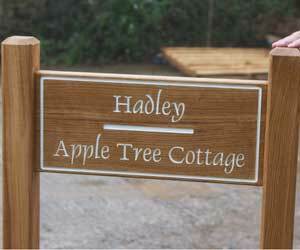 Natural Oak Entrance Signs are first treated with a wood preservative and then varnished with a tough satin finish commercial varnish. 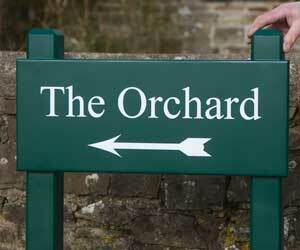 Signs with white lettering are treated with Osno Oil. 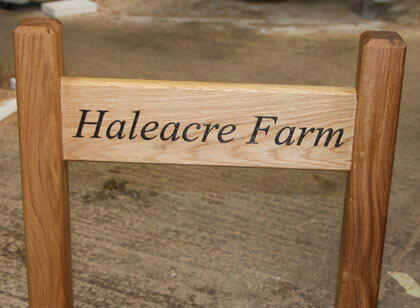 Iroko signs are treated with Danish oil. For Painted Entrance Signs we use is a two component polyurethane paint which is much more durable than standard brush on paints. It is not only much tougher and longer lasting, but is also more resilient to chemicals. Standard colours are black and white. We also have a grey - F&B Purbeck Stone and a pale green F&B Lichen as standard. Cream, heritage green and Farrow & Ball Estate No.84 green blue, Stiffkey Blue, French Grey amongst others at £5 per order. See all our Stock Colours. For colours we don't stock the cost is £65 per colour per order. We can match most Farrow & Ball colours. 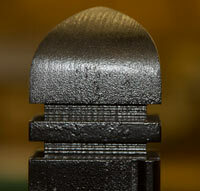 Post Tops - There are various options for tops of the wooden posts. They can be used for both hardwood and softwood. There is no extra charge for the standard post top. 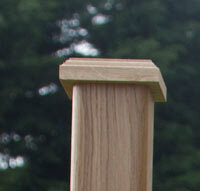 The shaped top, gothic top and oak post cap are @ £5 per post. Made in the UK. 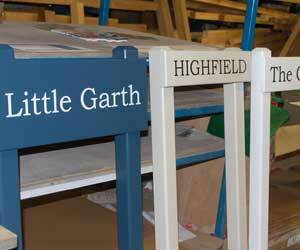 Our team at The Sign Maker looks forward to helping you with your entrance sign.